Thai cuisine is made up of a truly fascinating blend of South East Asian culinary traditions, with a great focus on light dishes, characterised by complex ingredient lists and tempting aromas. Hot spices are regularly used to complement the fragrant qualities of the food, resulting in dishes which taste just as good as they smell. Like most other Asian cuisines, a strong focus on diversity, detail and an overall balance are of vital importance to Thai chefs. With many recipes featuring an almost never-ending list of ingredients, ensuring all the flavors and textures work together well is easier said than done. The fundamental basics behind Thai cooking lie in the art of juggling together four taste sensations – sweet, sour, salty and bitter – to create a harmonious finish which pleases the palate in every possible way. 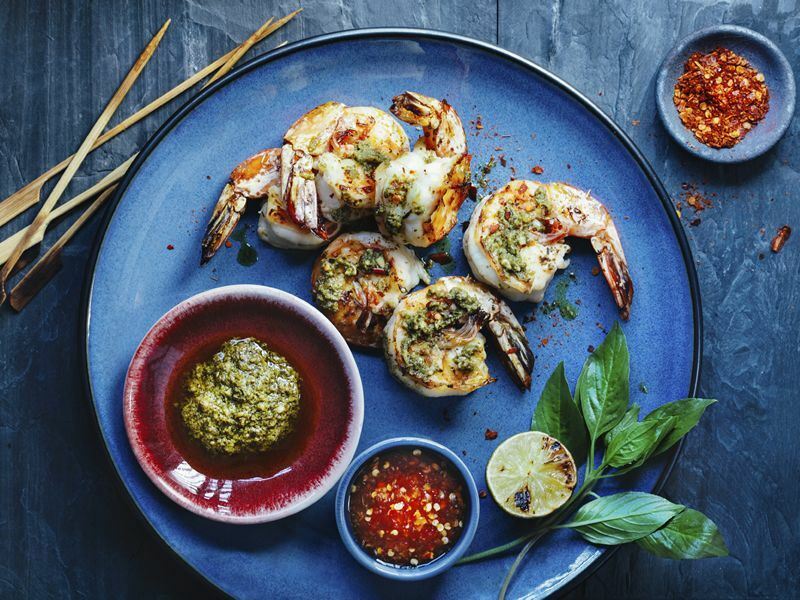 Thailand covers all sorts of land – from icy mountain tops and fast-flowing rivers to verdant rainforests and exotic islands – so it’s not surprising that the key ingredients in Thai cooking are bountiful and varied. Sauces play a huge role in authentic Thai cooking and feature in almost every recipe. ‘nam pla’ – a strong, aromatic fermented fish sauce – is one of the most common sauces used in Thai cooking. This type of sauce is a staple ingredient and imparts and unique and salty character into the local dishes. ‘Pla ra’ is another sauce made from fermented fish. This sauce is more pungent than nam pla and is often opaque, containing whole pieces of fish. Pastes are another important ingredient in Thai cooking. Thai shrimp paste is one of the most common types of paste – made using fermented ground shrimp and salt – and is normally used to make another sauce which is then used as a base to create a final sauce. Thai curry paste is one of the more common ingredients and is often used in homes throughout the world. This type of paste is prepared by crushing chillies, garlic and other ingredients together in a mortar and pestle. Rice is the staple grain in Thai cuisine. The aromatic, sweet-smelling jasmine rice is indigenous to Thailand and grows throughout the paddy fields which cover the central plains. This type of rice is usually served up steamed as a side dish alongside curries and stir fries. Sticky rice is common throughout north and northeast Thailand. This variety of rice contains an unusual balance of starches which are found in all kinds of rice, resulting in a unique sticky texture when cooked. Unlike rice, noodles are usually served as a dish in their own right, in the form of a stir-fry or a noodle soup. In Thailand, noodles are commonly made out of rice flour, wheat flour or mung bean flour and come in three main variations: wide flat noodles, thin flat noodles and round thin noodles. Thai cuisine is best known for the generous use of fresh herbs and spices. Some of the most commonly used herbs and spices include: lime leaves, coriander, chillies, garlic, galangal, turmeric, Thai basil and lemongrass. Pad Thai is without a doubt Thailand’s most well-known culinary masterpiece. This traditional stir-fried meal comes in a myriad of variations, usually depending on which ingredients are in season and what the chef has on hand. Traditional Pad Thai usually features rice noodles, tofu, spring onions and bean sprouts, all topped off with a sprinkling of crushed up peanuts. Variations often include the addition of prawns, chicken, crab or another source of protein. During the late 1930’s and early 1940’s, Pad Thai grew in popularity in Thailand. Following World War Two, Thailand’s fascist government named Pad Thai the national dish in an attempt to cut down on domestic rice consumption, leaving more available for exportation. This campaign was extremely successful and today you’ll struggle to walk down a busy street in Thailand without seeing numerous restaurants and street vendors selling their variation of this signature dish. Som tam translates into ‘green papaya salad’ and originates in the north east of Thailand. Thanks to its delicious flavor and nutritious benefits, this light and healthy salad has grown in popularity over the years and today is found all across the country. Like many Thai dishes, the recipe for som tam varies from region to region and can lean toward the sweet or sour side, depending on who is cooking it. Common to all som tam recipes is the use of shredded green papaya combined with a healthy dose of heat in the form of chillies. This salad is perfect as a starter or a side dish, but can be a bit light as a main meal all on its own. When served as a main dish in a restaurant, it’s usually accompanied with sticky rice, cooked prawns, crab or cashew nuts. Tom yam goong is one of Thailand’s most fragrant soups, thanks to the generous use of fresh aromatic herbs. An exotic blend of galangal, lemongrass and lime leaves provide the signature smell of this soup, whilst hot chillies and fish sauce give it a tangy, spicy kick. The stars of this dish are juicy mushrooms and extra large prawns, known locally as ‘goong’. The “tom” refers to the boiling part of the cooking process, whilst the “yam” refers to a type of Lao and Thai spicy and sour salad. This means the name “tom yam goong” literally means Lao and Thai hot and sour soup with jumbo prawns. Kuay tiew is best described as noodle soup. This simple and light dish is as messy as you would imagine and requires the eater to slurp noodles with the help of chopsticks then finish off the remainder of the bowl by sipping it like a giant cup of tea. Just like Pad Thai, kuay tiew comes in copious variations – so many so that if you ate it for every meal during your stay in Thailand, you might never have the same flavor experience twice. The noodles in the soup are usually thin and are served up in a clear broth with just about any kind of edible meat, with duck, chicken, beef, pork and seafood being amongst the most common. A sweet and spicy combination of roasted cashews, chicken, soy sauce, garlic, honey and chillies, gai med ma moung is one of the most characteristic dishes of Thailand. This harmonious combination of eclectic ingredients uses many of the signature flavors, smells and textures that have caused Thai cuisine to become so popular internationally. Whilst this dish can be prepared and served anywhere in the world, chefs will have a tough time re-creating the unique and somewhat smoky flavors that the fresh Phuket-grown roasted cashews bring to this dish. The Thai equivalent of traditional British fish and chips, khao man gai is a ubiquitous meal usually served during the day at dedicated restaurants and food stalls. Testament to the popularity of the dish and freshness of the ingredients, local eateries frequently run out of khao man gai within hours of serving, so make sure you get in there early if you want to try it. The chicken for this dish is delicately simmered until juicy and tender. To avoid waste and soak up leftover flavors, the water the chicken was simmered in is also used to boil the rice. This results in a dish which – whilst certainly high in flavor – is also high in cholesterol. The chicken and rice are served side-by-side, liberally dressed with a chicken broth and an assortment of sweet and spicy sauces. This recipe serves two as a complete main meal and takes around 15 minutes to prepare and 15 minutes to cook, which means you can have dinner on the table within 30 minutes. This version is much quicker to make than regular Pad Thai and cuts down on some of the ingredients which you’ll struggle to get a hold of outside Asia. If you can’t find rice noodles, soy sauce, bean sprouts, tamarind paste or fish sauce in your local supermarket, try looking in your nearest Asian or Chinese supermarket. If you don’t want the hassle of trailing from shop to shop, you can easily get your hands on these ingredients online. The secret to this recipe is cooking the noodles perfectly so they’re sweet, sticky and still have a bit of chewiness to them. To ensure you don’t end up with soggy, over-cooked noodles, keep an eye on them when you cook them the first time round and don’t leave them in the water for longer than 6 minutes.